Iran's former consul-general, Mohammed Reza Heydari, in Oslo, Norway, has applied for asylum there. President Ahmadinejad declares Iran a "nuclear nation"
(CNN) -- As Iran marked the 31st anniversary of the Islamic Revolution, a high-ranking Iranian defector warned that the national unity of Iran could be threatened if the government steps up its campaign of violence against opposition groups. "If they (Iranian officials) move in the direction of violence, they will not be able to control the system and we might move in the direction in which Iran's unity then might be compromised all together," Mohammed Reza Heydari, Iran's former consul-general in Oslo, Norway, told CNN's Christiane Amanpour. Heydari, who defected after violent confrontations in Iran on the Shiite Muslim holy day of Ashura in late December, has applied for political asylum in Norway. He said that he hopes the strikes, civil disobedience, and non-violent protests in his homeland will "break the back" of the government and force it to listen to what the people say. "The cause (of) bringing the message, bringing different groups together, is starting a referendum to have free elections in Iran so all these groups can stand together and bring about a democratic government to meet the demands of all religious and ethnic minorities as well," he said. Heydari's comments came as the Iranian government deployed thousands of police and Basij militiamen in Tehran and other cities to prevent anti-government protests during anniversary celebrations of the Islamic Revolution. Eyewitnesses said Iranian security forces quickly broke up any opposition protests, though CNN could not independently confirm the reports. Meanwhile, hundreds of thousands of people attended a pro-government rally in Tehran and heard President Mahmoud Ahmadinejad declare that Iran is now a "nuclear nation" and has already produced its first batch of 20-percent enriched uranium. 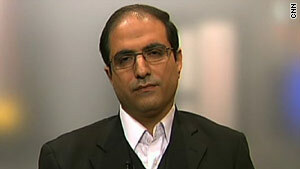 Heydari told Amanpour that the divisions in Iran are reflected in his country's embassy in Oslo. "There's chaos ... The diplomatic corps and the intelligence corps are split at our embassies right now," he said. He insisted the anti-government protests are not influenced by foreign governments, a charge that Tehran frequently levels at countries including the United States and the United Kingdom. "The government is saying these things as a way to sort of scatter the thoughts to create an imaginary enemy, to connect what is happening to the West -- whereas this is an in-born Iranian issue and has to do with the way the Iranian government has treated its people," he said. Heydari said he defected because of the government's crackdown on protesters during Ashura -- one of Islam's holiest days. He said a government delegation had tried to persuade him to return to Tehran. "They contacted me and made some proposals so that I would return to Iran -- and when I returned ... to have an interview and deny my resignation." He added the delegation also wanted him to condemn the West, but he refused to go back. Meanwhile, Former White House national security aide Gary Sick, who was the Carter administration's point man on Iran during the revolution, told Amanpour the Iranian regime is getting better at cracking down on the opposition. "Repression does work. And they are much more organized in terms of keeping things quiet and keeping the opposition down than they were before," he said. "As they've done that, however, the price that they pay for it is that the demands of the opposition go up." Sick said the government's short-term success in beating down the opposition may not work in the long term. "The short-term goals of repression and holding things down oppose the long-term goals, which would be really long-term legitimacy and support -- and basically they're losing that all the time," he said. Sick noted that many of the people who were closest to Iran's former supreme leader, Ayatollah Khomeini, have now joined the reform movement. "They are all on the side of change, and they all believe that the revolution has not, in fact, met its goals, that it has cheated the people in terms of what it promised and what it actually delivered," he added. Sick said the best way the West can help reformists in Iran is to make it much easier for Iranians to keep the Internet open and functioning. "If they had a way of getting news out and to actually say what they wanted to say freely on the Internet anonymously, you would have a flood of information coming out of Iran that would be really valuable," he said.